We’re sick. It figures, right? Spring break for the monkeys, school for me… let’s all get sick! It’s nothing major, just the creeping crud with a cough that just about everyone seems to have had, and it’s our turn now. So last night, all the kids off to dreamland, I popped some nighttime cold medicine in hopes of knocking myself out and crawled under my covers. It worked. I was knocked out hard, and only came-to when I head Abby coughing hard and crying. Her room is right next to mine, so I didn’t think she’d been crying long- and when I glanced at the clock, I saw that it had only been 45 minutes since I went to bed. It felt like it had been days and I was underwater, but it hadn’t even been an hour. Disoriented isn’t even the word. Bleary-eyed and under a NyQuil haze, sat on the edge of Abby’s bed and tried to calm her. Now she’s a bit of a drama queen, and this was not the moment to go all Sarah Bernhardt on me- so when I tried to pull her into my lap to comfort her and she began to wail like a stuck pig, it didn’t go over well. Rubbing her back and trying to calm her down, I could see she was making her cough worse with her howling and crying and she started to gag. This did not need to be happening. When she started to gag, she panicked, and stuck her hand in her mouth, and up came the hot dog she had for dinner. Nothing is worse than hot-dog barf, people. Trust me. I yelled at her. She seemed hysterical, and maybe I was too- but I yelled at her. I told her to stop screaming, that she was only making her cough worse and hurting me and herself. My almost-five year old is sick and confused, and I yelled at her. I felt about three inches tall. She stopped screaming and looked at me in shock. But at that moment, the important thing? She stopped. Right then in NyQuil haze-confusion, I needed her to stop. She looked at me, face all blotchy from crying and coughing, and tears sprang to my eyes. Awesome mom of the year. I feel like I failed a test last night. Like, here was something really hard and my daughter needed a tender, patient mother, and instead got a crazy-tired, sick mama who was mean. Mom FAIL. This morning, she’s fine, and while still coughing, snuggled with me in bed and fell back asleep in the pre-dawn haze. She kisses my cheeks and tells me she loves me and doesn’t seem to remember the mean mom who yelled at her when she was distraught. But I do. 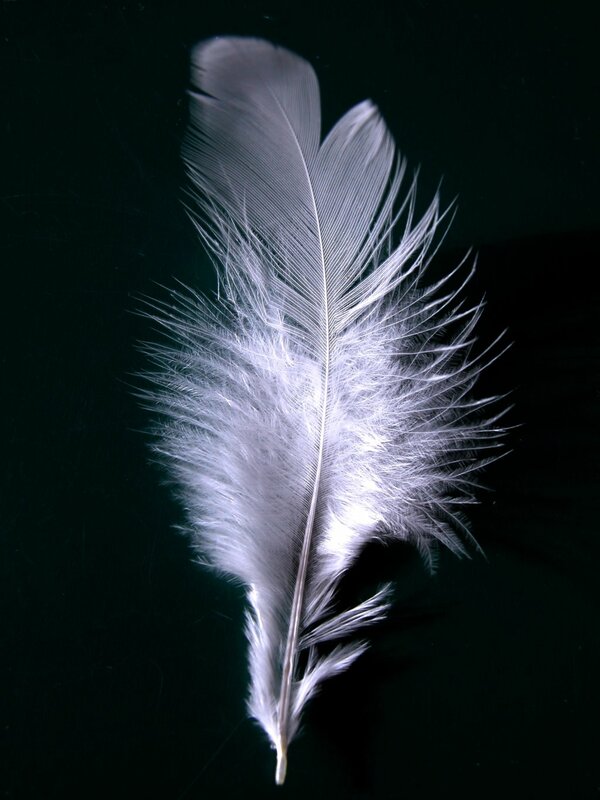 And my heart surely outweighs the feather this morning. In my opinion, that was totally NOT a fail! She needed to be “snapped out of it” or you’re exactly right, she would have continued to freak out and hurt herself and you. She needed to calm down. I think you did exactly the right thing! All is well. You’re an awesome mom! It’s cool how kids are forgiving of our blips, big and small. Those snuggly loves are how you both really feel. The middle of the night flip-out is gone for her, both hers and yours. Focus on the huggles. I agree with Julie. Sometimes you have to make a LOT more noise than them to get them out of the ‘freak out’ loop. There’s a limit, you reached it, and she knew it. She’s not damaged, you didn’t attack her emotionally (belittle or demean or tell her she’s bad) You simply laid it on the line. Loudly. Give her and you a hug, shake it off, and try to do something nice today for both of you. Even if it’s only a special drink or cheese or fun dinner. We have the cough of doom here too. the cough/ gag/ vomit cycle is something I’ve been fearing for the last 3 nights! My little siblings used to do it, but my kids don’t seem to have the ultra gag reflex. Bless their Daddy and all the genetic awesome he brought to our party! I don’t think it was a bad mom moment, anymore than I think it is bad to slap an hysterical adult to get him to snap out of the hysteria. I have had to do it to my kids and am sure I will again. I’m agreeing with those above who said you did the right thing. You might feel like a failure, but you aren’t! We’ve had to throw water into the face of an hysterical child before just to get him to STOP. Then we could deal with it and show him love. Trust me, you didn’t fail! I’m not seeing how being more patient and enabling the flailing would have landed you both in a better place……..
It’s never a great feeling to yell at your kids, until it is a GREAT feeling to yell at them and they stop. And then you can all start over again. And girls, you (and by that I mean I) never know if it is real or drama. I always assume drama. I understand the feeling of failing as a mom. Your expectations for yourself were not met. You were not in a condition to meet them last night. However, today is a new day. Abby is cuddling with you and loves you. She probably doesn’t remember her screaming fit last night, and in the long run won’t remember your yelling – but she will remember you came to her room and you were there when she needed you. Even though she didn’t know what it was she needed at the time, and even though you feel like you didn’t provide what she needed. We all have times we don’t measure up, Tracy. Remember you are in good company, and especially remember you are doing your best, on your own, without another parent to take over when you aren’t feeling up to par yourself. All you can do is your best – and that varies depending on the circumstances at any particular moment. Agreeing with Julie and Em over here, too. If I could yell at you to make you stop, I would – but Michelle wouldn’t like any hugging and cuddling. Well. My momFAIL still beats your momFAIL. It’s a long convoluted story involving traveling sans Dad with teens and pre-teens, sleep deprivation, and other assorted psychic-owie critical mass. It would be boring, but it’s just my benchmark for how bad I could get. Thank heaven I only got that low once. That I recall. Don’t beat yourself up over it, looks like no permanent harm has come of it. Get some rest and I hope you all recover quickly. Oh my goodness. Please don’t tell me that’s a fail. I feel bad enough about my day as it is!!! You did exactly what I would have done. Oh well – let’s be REAL together! One of the things I’ve always really respected about my parents is that they were willing to apologize to us kids when they felt like they’d done something wrong (like yelled at us). The atonement covers mom fails, too, and apologizing when you’ve done something wrong is a chance to make a relationship better by showing that you care more about the feelings of other person than you do about your own pride. i don’t have time to read the comments right now but you NEED to know that you did NOT fail. sometimes, you have to do whatever you can to get through the moment. i am not a perfect mom and i’ve done that same thing and even worse. one time, i threw a glass of cold water in my daughter’s face, just to get her attention and SHUT HER UP. i felt bad for just a second and then i realized she had stopped screaming. sanity was restored all around. you yelled, it’s okay. please, try to be nice to your self. and, as the commenter above me mentions, apologize if you feel you have to. you are a GREAT mom. you’re not perfect honey–and you’re in good company.